If the building design of your home has left you with a windowless bathroom, it might feel like you’ll be stuck with a gloomy room forever. Well fortunately, there are some handy design tips that could brighten up even the dullest of bathrooms. We’ve collated the best tips for your bathroom, that are easy to carry out and will help you to create the illumination you’re looking for. Read on to find out how you can make small changes and create a beautifully lit haven in your home. If you do happen to have a small window in your bathroom, a great way to maximise the light it brings in is to strategically place a mirror opposite it. This will allow the natural light to bounce off the mirror, and fill your room with a warm glow. You can also get this same effect without natural lighting, by placing ceiling lights or lamps around your mirrors, again enhancing the light already in the room. Alongside using mirrors to create brightness, you can also experiment with your lighting in the available space. When selecting your bulbs, consider warmer tones to give the room a cosy feel. You could install spotlights in alcoves to create space, and use the lights in strategic places such as under cabinets to give a feeling of all round brightness. You don’t just need to stick to your ceiling lighting to make your room look bright either. Positioning table lamps or even hanging spotlights around your bathroom can illuminate the space. If you use the right colours, you can not only create light in a windowless room, you can also create space. White is a great colour for giving off brightness, as it bounces any existing light around the room. 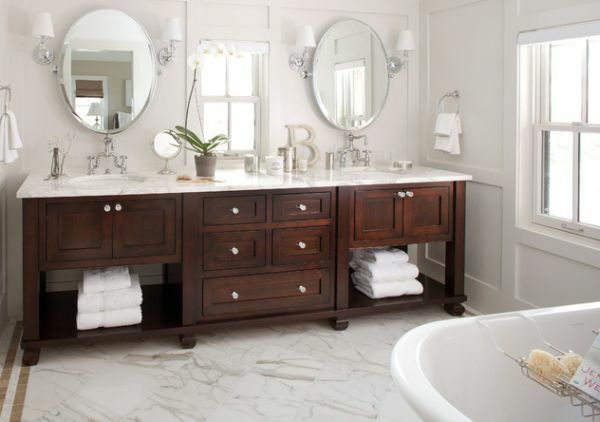 You don’t need to change your space too much, just incorporating a white bath tub, cupboards and towels can have a big effect. Keeping your room decorated in one, light colour will also help create light. Instead of fitting hundreds of tiles, you can install cladding, such as marble-effect cladding. This design is not only modern, it can also reflect light around your room and create the brightness you’re looking for. Alongside buying white furniture, you can do other things with your bathroom fittings to create light. Instead of frosted glass in your shower, try textured glass. This will protect your privacy while also allowing light to travel through the glass and into every corner of your bathroom. You can also consider installing a bathroom sink and using shelving rather than cupboards underneath to expose even more space, and allow light to come through. So, as you can see, you don’t need to make big changes in your bathroom to create the sense of light you need. Making aesthetic changes to your colour scheme, and to your bathroom furniture can really help to brighten up your space and illuminate its features.